Urban sprawl back in the Northeast US usually appears to me as something that has happened; a process that took place centuries (usually decades) ago and only now do I see the effects of past urban and industrial centers. But out here in Montana, the population and spread of settlements sits still so sparse that such towns as Belgrade stands obviously as a dependent of "big city" Bozeman. Still thriving today as a "suburb", the town has a great deal of character, complete with the old-timey feel. 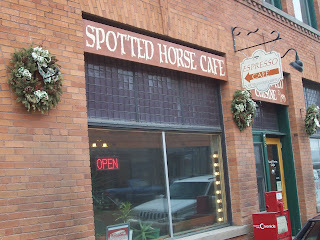 One particular place that seems frozen in time is the town's coffeehouse, The Spotted Horse Cafe, located right near the main intersection. Business has gone continually for 30 years now (if not longer) which definitely puts the original owners as ahead of their time. But despite their years of operation, it seems they haven't changed much since their inception (who charges $0.50 for cream?). The venue has a saloon bar with a large mirror behind it, heavily dominating the pizzazz-less interior (granted they might be going for that old west, neutral color look). The largest detractor was that the place reeked of onions (they served a full menu, which brings it back to the age old question of whether a coffeehouse should do so with such risks...). The coffee of their choice was Montana Coffee Traders and when brewed fresh, tasted decent (their brewing methods seemed up to par). The espresso was OK, but after taking an initial sip, I asked the barista for cream, to which she insisted on adding, and ended up diluting it heavily (sigh). I didn't catch the tea or chai. To put it simply, the Spotted Horse Cafe may have been a pioneer in specialty coffee, but I would recommend they update some of their practices. It's one thing to have history, but it's another matter to not alter with the times. Nonetheless, if you're in the Bozeman area (especially if you fly into the airport), take a side stop to try out the java at the Spotted Horse in nearby Belgrade. If anything, it's a nostalgic cup of coffee. It was rather interesting for me to read the article. Thanx for it. I like such topics and anything that is connected to them. I definitely want to read a bit more soon. Sounds like things are a bit different than my last trip two years ago. Next time I'm in the area, I will stop by soon.